Artists Archives - Look what I made! The NAMM Show is the annual conference for the National Association of Music Merchants. It is, by far, the largest music event that I have ever attended. It brings together performing artists, buyers, sellers, manufacturers, music agents, and music education advocacy groups all under one conference. 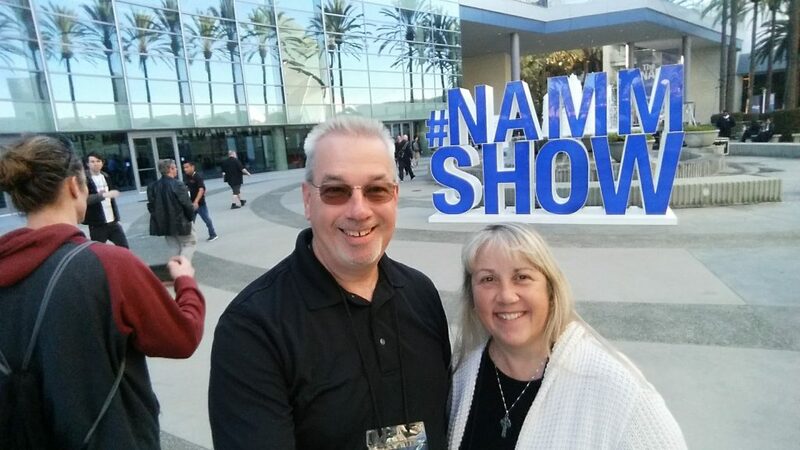 Mike and Karen McCausland at the NAMM Show. It was held at the Anaheim Convention Center and attracted thousands of people. It was just a stones throw from Disneyland. I stayed for 3 days and I still haven’t been to all of the vendors. I have also been to many workshops, most involving education where I still have a passion. One of the great things that I was able to do was to meet new and aspiring artists in the field of music. I spoke at length with a couple at a round table discussion for the industry. We met an AR guy who gave many insights to those there. I was pleased to meet a delightful young lady from Oklahoma named Ciara Brooke. She was typical of the countless number of people following their dreams. I will certainly go again to this amazing event. It was well worth the trip.